Join forces with the Elves to protect the wilds of Avalon! Peace has come to Camelot, but danger always lurks around the corner! It's time to make new allies to guard against any future threats. As the Royal Druid Mallard, can you secure an alliance between King Arthur and the Queen of the Elves, to ensure that both Camelot and the wilds of Avalon are mutually protected? 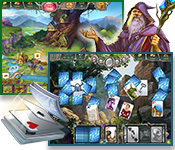 Read more about Avalon Legends Solitaire 3. 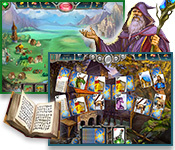 Read more about Avalon Legends Solitaire 2. 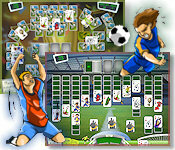 Put your solitaire skills to the test as you first collect the cards, then arrange them in their correct order. Collect bonus cards and awards as you journey across the mist-shrouded land of Avalon, to save its people from evil. 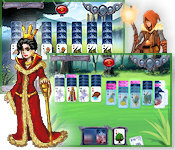 Read more about Avalon Legends Solitaire. Read more about Arizona Rose 2. Your bride-to-be has gone missing, and you've been framed for her kidnapping! 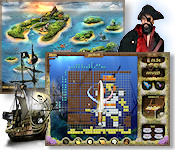 As a retired naval officer, you now must scour the seven seas to solve the mystery and bring her home. Match cards and fire cannonballs to clear the levels and gather the clues and tools you need to find your darling Elaine. Do you have the skills and the courage to conquer the ocean's dangers and become a captain of legend? Read more about Seven Seas Solitaire. A chance discovery sends Arizona Rose on a new life of adventure! This humble collector of antiques has stumbled across Blackbeard's treasure maps, and it's up to you to help decipher them. 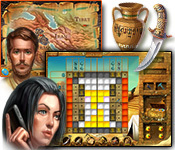 Solve picross puzzles to unlock the maps' secrets, then tackle a variety of mini-games to claim the treasure. Discovery awaits you! 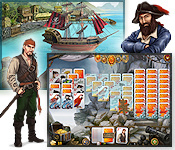 Arizona Rose and the Pirates' Riddles features over 200 levels of puzzle fun, 5 power ups to enhance your game play and 15 awards to collect. Read more about Arizona Rose. Welcome to the once glorious empire of Avalon, now clouded by the darkness of the evil Morganna's spells. After defeating Morganna in an intense magical battle, Evelyne, the protector of Avalon, must now cleanse Avalon from the dark curse with her Rune Magic. It's a must have game for all puzzle game fans. Read more about Runes of Avalon 2. The park is doomed unless you come to the rescue! A greedy developer has planned to pave over the city park and evict your grandmother from her home there. 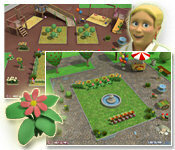 Match the tiles to sell magic trinkets and raise money to clean up and decorate the park. If you can turn it into a space that the whole neighborhood loves, maybe you'll get the help you need to thwart the evil plan and save the park! 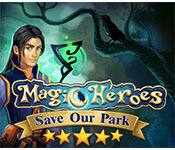 Read more about Magic Heroes: Save Our Park. 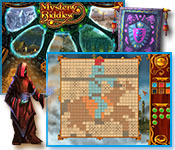 Mystery Mosaics features two modes of play - Pick-a-Pix and Fill-a-Pix - each with 100 challenging levels. Travel across the land, visiting exotic locales and learning the lore of the realm as you work to unravel the puzzles and crack the secrets of the Mosaics. Beautifully painted backgrounds and ever-increasing challenge await you along the way. Read more about Mystery Mosaics. Mystery Mosaics II is nonogram (aka Picross, Pic-a-Pix or Paint-by-Numbers) with a colorful twist: This time around, each mosaic is made up of three colors of tile, each of which must be solved separately for three times the fun. The more precise and efficient you are in solving the game's 100 levels, the more points you'll earn and the faster you'll be able to rebuild the structures of the ancient city. Fun game in Halloween atmosphere! Free puzzle game for everyone. The land of Mysteria was once kept safe from the forces of chaos by Great Tapestries, woven by the Pictomancers of old. Now, the tapestries are fraying and it's up to you to restore them and fend off the darkness threatening the land. 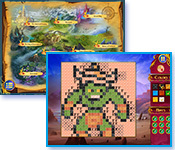 You can take on this quest in one of two game modes - pic-a-pix or fill-a-pix - each of which offers 100 challenging levels. It's a double helping of puzzling fun! Read more about Mystery Riddles. Dress-Up Pups is a Match-3 game that puts you in charge of a luxury fashion agency catering to the most extravagant dog-lovers. 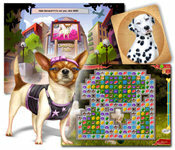 Each customer has a unique vision for their pet's ultimate outfit; help them bring their dreams to life through both classic and chain-style match-3 game play, plus jigsaw puzzle mini-games! Dress-Up Pups features 190 levels of match-3 fun. On the way to your design success you will meet 10 amazing characters and will create 21 unique outfits for their dogs. Take part in the annual Festival of Chicken Egg. Help Tom to gain mastery of this competition and win the Great Final. Learn adventurous history and get to know who Zuzanna is and what her role in Tom's life is going to be. Find out why Tom is going to fight infamous Joe. Who else will Tom meet on his way to the Final? Who will win the Mayor's Award? Play our game to find all the answers! 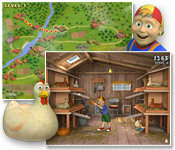 Play three mini-games: catching eggs, hitting the target and so-called three cups. The awesome graphics and addictive gameplay will delight everyone, not just the youngest. Read more about Tom's Hen House. Maggie loves gardening. She plants flowers, bushes, designs fountains and places dwarfs. Her gardens are known in neighbourhood. Every year Maggie win's Best Garden prize. Can she win this prize this year? With your help for sure. Great for everybody, all ages! Read more about Maggie the Garden. 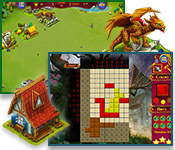 About: Jigsaw Puzzle Game: a tiling puzzle that requires the assembly of interlocking pieces. About: Sometimes relaxing, sometimes stimulating, always fun. Simon the Farmer has many tasks to do. Fly over the Camomile Valley. Like every year inspect the fence and repair broken parts. 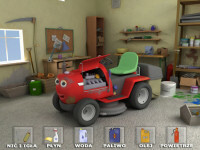 Help lawnmower preparing for hard work. Take care of the sheeps. Read more and watch screenshots. Read more about Simon the Farmer.